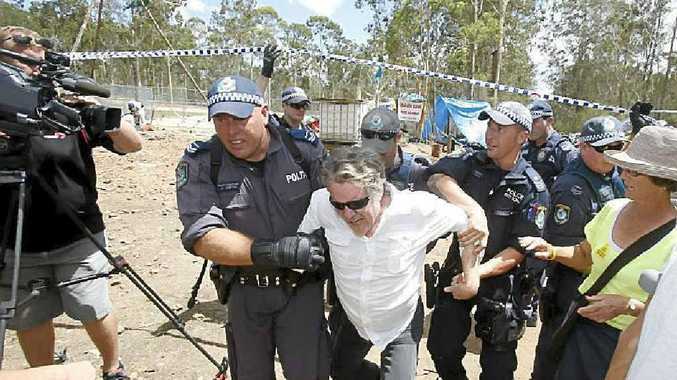 A man is forced out of the line by police as they move people back along The Avenue as the road is closed around the Glenugie CSG site. BOTH SIDES of the battle over coal seam gas were deflated yesterday after an intense day of action in which no one could be declared the winner. 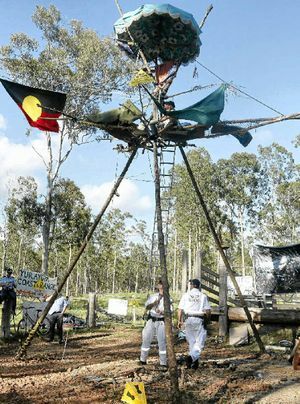 A concerted police operation succeeded in breaking up the 48-day blockade, and 14 Metgasco contractor trucks gained entry to commence exploratory core hole drilling. 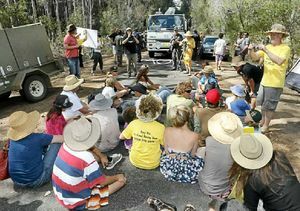 Protesters sit down in front of a truck carrying equipment to the Glenugie CSG site. But protesters were quick to proclaim Glenugie a symbolic victory, arguing that that level of police response required to break the blockade could not be indefinitely repeated. "This is what the future looks like for Metgasco - potentially they face this at every site they go to," Lismore author and activist Aidan Ricketts declared. "If they want to do this at every drill site for the rest of the year, they've got a very big job ahead of them." 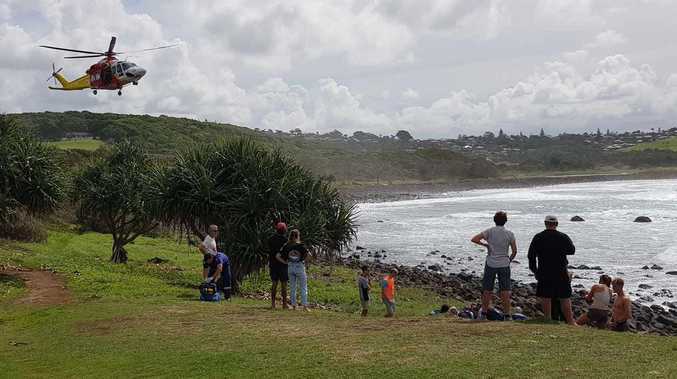 Mr Ricketts described so-called "gasfield free" communities as a cross between neighbourhood watch and the bushfire brigade, and said Glenugie established an example for other communities across the Northern Rivers. "It's not about any one site, it's not about any one place, it's about fighting them at every place continuously.... it's the long attrition of this that's going to count against the government," he said. It is understood that three more exploratory drill sites are planned in the short-term for Metgasco - Doubtful Creek south-west of Kyogle, Naughtons Gap north-west of Casino, and Banyabba, between Casino and Grafton. A Metgasco spokesperson refused to comment on the break-up of the blockade, but emphasized that Metgasco's planned operations would continue and were legitimately approved by the state government. CSG Free Northern Rivers spokeswoman Annie Kia echoed the protesters' victory claim, arguing that the anti-CSG community was playing the long game. "We're looking at this in the long-term... history shows us a united people cannot be defeated," Ms Kia said. 5.50am: "Red Alert" warnings from anti-CSG activists say Metgasco vehicles have left Casino and are on Coraki Woodburn Rd on their way to Glenugie. 6.30am: First reports of about 30 police arriving on scene with tactical response unit. Protesters are singing. One sets up a seat in the towering tripod. 8am: We hear the drilling rigs and associated vehicles have arrived at each end of the test site. The crowd of protesters swells and more police arrive. 8-10.30am: Reports of arrests as people chain themselves to vehicles in a bid to stop them entering the site. Twitter is on fire with comments. 10.45am: Police announce they are closing the road and will be pushing the crowd of protesters back down 8 Mile Lane to allow the trucks to enter. 1-2pm: Blockade broken and trucks entre drilling site.